No matter what mess your royal-wedding mug throws at you, there's a commemorative tea towel to soak it up. In December, Buckingham Palace deemed disposable items like tea cloths and T-shirts "in poor taste," refusing to give them its official seal of approval. But in January officials had a change of heart, ostensibly to appease manufacturers like supermarket chain Asda, which had already planned "Royal Dry-ness" tea towels. Now department store John Lewis is offering a 30-in. (76 cm) towel emblazoned with a crown, the wedding date and a William & Catherine logo for $10. 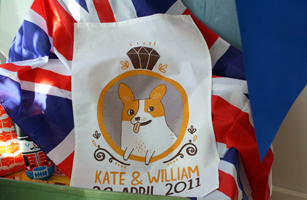 And ToDryFor, an Oxford-based tea-towel business, offers a more playful "Corgi Royal Wedding" towel for $16. "Just remember that the key to a good marriage is making sure you don't take each other for granted, which means sharing chores!" the online description reads. Did you hear that, William?